Hayley Watts and Sam Hajjar snap a selfie Dec. 3, 2016 with their dog Benji. Couple moving wedding to Fla. as Florence heads to N.C.
A couple planned a Blue Ridge Mountains wedding, with green hills and a teepee. But Hurricane Florence has them scrambling to put together a Florida wedding. 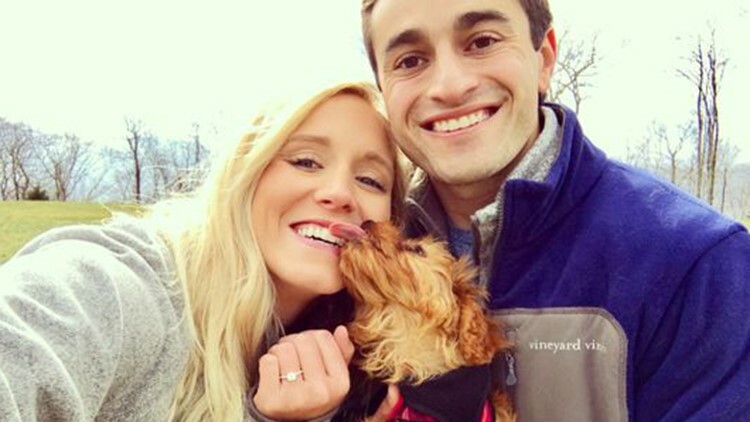 The Naples Daily News reports Sam Hajjar and Hayley Watts were engaged two years ago and planned to marry Saturday in Banner Elk, North Carolina. In the face of Florence, however, they canceled their plans and quickly moved the nuptials to Tallahassee. Three days before their wedding, they were scrambling for a venue, flowers and a cake. Fortunately, most of their friends are in the Tallahassee area. For more, read the Naples Daily News story.